There’s nothing like an exotic safari and near-death experience to make one open-minded about food. Travel back with me to the time I ventured to eat crocodile in Southern Africa. Victoria Falls is one of the world’s great natural wonders. The wide Zambezi River thunders majestically along the borders of four countries: Zimbabwe, Zambia, Botswana, and Namibia. Its surrounding flood plains and savannahs provide hospitable, seasonal refuges for testy hippos and crocodiles, elephant and antelope, hyenas, zebras, and even large cats. 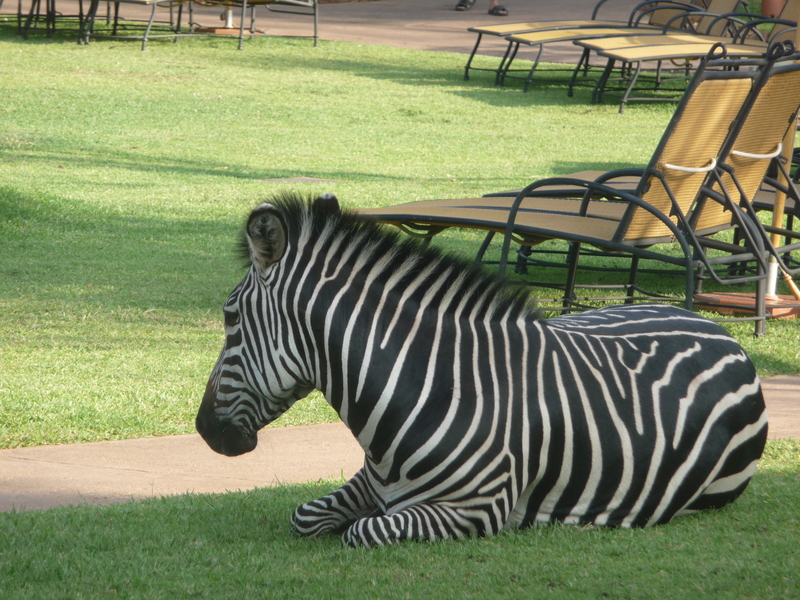 It is a great place for safaris, and I was fortunate to experience one for myself. Staying near the Falls and Livingston, Zambia, it took a combination of bus, boat, foot (border crossing), and wagon just to start our Botswana safari. 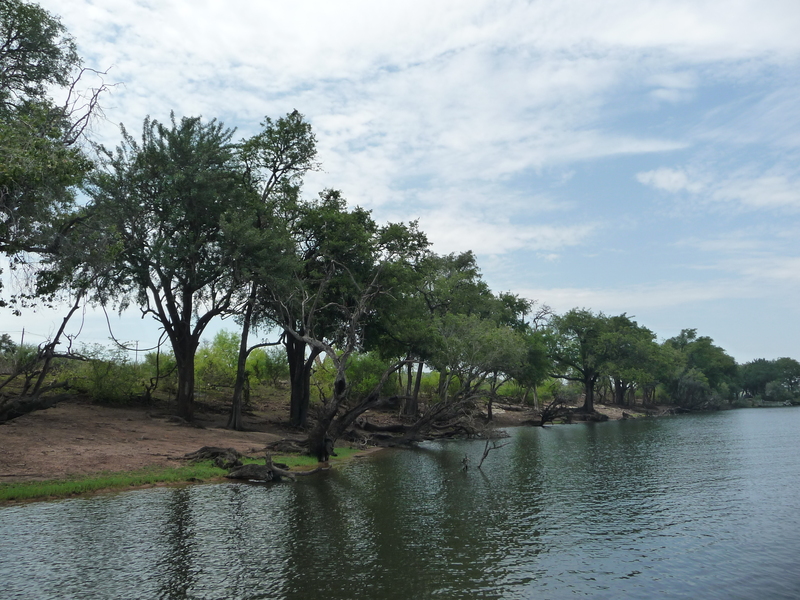 We kicked off the safari with a pontoon boat tour of the river that separates Botswana from a skinny slice of Namibia. My colleague and I befriended a mixed group of Americans and Aussies, three of whom had amazing new digital cameras to shoot promotional material for a large camera manufacturer. We reveled at the ubiquitous hippos and crocodiles, as well as a few elephants bathing in riverside ponds. After a buffet lunch that skewed Italian, our bunch made our way to guided Jeep land tours. Hoping to catch a rare November glimpse of a big cat, we weren’t successful, but we saw antelope and related species frolic, along with numerous birds, and elephants peacefully grazing nearby. Or so we thought. A sudden thunderstorm arose. Here’s something to know about Elephants: They absolutely lose their (expletive) with thunderstorms. If you’ve ever seen a dog or horse panic with thunder, that has nothing on elephants. Because when a particularly loud clap of thunder shook our patch of earth from less than a mile away, probably every elephant in the area – males, females, and babies – took off running. No, stampeding. As in what you read in books when you are a curious child, never envisioning that it actually does happen in the wild. A herd of elephants stampeding unidirectionally is a truly amazing and frightening thing. It is the sort of event that you don’t appreciate the full magnitude until after the fact. But when elephants began to swarm and crowd our Jeep, which stood between them and safety, our guide and driver froze, telling us not to move or make noise. No words, just freeze. The rest of us were silent, thinking, uh oh…if HE’S scared, and he does this almost daily, maybe we should worry. With the engine off and our obnoxious tourists’ dialogue ground to a halt, the stillness in the pre-rain air, the sound of strangely fast elephants lumbering through the underbrush and dust, the smell of rain in the not so far distance – it provided an eerie moment and reminder of the awe, beauty, and danger in nature. Two minutes later, the vast majority of maybe 60 elephants had passed us without incident, running away from the river. We then turned around and slowly gained speed to get the heck out of there. We made it safely back to our wagons, then boats, then to the Zambian border, where I almost was detained because I’d made the mistake of a single-entry visa. Oops. A few phone calls later, we were allowed to return to Zambia and the comfort of our hotel. The day’s events certainly conjured up an appetite for dinner. Choosing to splurge on a sumptuous buffet, we sampled a range of what I call “safe” dishes cooked to appeal to the typical international traveler – African resort-ified versions of European and American standbys. If course, being an exotic destination for the average guest, the hotel also offered westernized versions of African dishes, including crocodile. Having survived an elephant stampede, I had every reason to try crocodile. Note to the casual reader: I will try almost anything vegetarian and weird, but mystery meat scares me. So while this might sound like a no-brainer to many of you, it was not to me. So I was pleasantly surprised at the tenderness and turkey-like flavor of the crocodile. It was easy to forget I was eating a scaly, carnivorous reptile capable of tearing me to shreds like a baby water buffalo. It was meat! It was simply grilled, allowing the flavor of the steak to stand for itself. Some say it tastes like chicken, but to me, the meat was visibly more pink, like turkey, and it had more flavor than chicken. So maybe chicken-eating crocodiles would taste like chicken…? At any rate, the crocodile steak was much less exotic and more familiar than I would have expected. It was another reminder that our world is small, full of experiences we can all relate to as humans – well, humans with income and means. Despite my own American privilege and the shelter offered by a tourist’s bubble, I felt honored to experience this slice of Africa, its friendly and survivalist peoples, and even a crocodile steak.